I Ordered the ‘Bread-Sliced’ BagelsJust because you can do something doesn’t mean you should. Bagel Maven Melissa Weller Is Baking Again in New York at High Street on HudsonWest Village brunch has never looked better. I Think About This a Lot: The Bagel Retrieval Scene on The LeftoversJustin Theroux’s Kevin Garvey desperately tries to get a grip on his sanity — and his carbs — in a world of unknowns. New Yorkers Not Compelled to Copy Cynthia Nixon’s Bagel Order This MorningLox on a cinnamon-raisin bagel remains a very niche choice. Kendall Jenner Just Likes Bagels, Okay?Nothing wrong with that. The Absolute Best Bagel in New YorkTwenty-three hand-shaped, kettle-boiled, and just generally excellent options. The Inventor of the Automated Bagel Machine Has Left Behind a Mixed LegacyDaniel Thompson brought the bagels to the masses, but some say he ruined the bread. Sadelle’s Is Officially Open and Ready to AppetizeThe Major Food Group team stealthily opened the babka-and-bagel floodgates this morning. 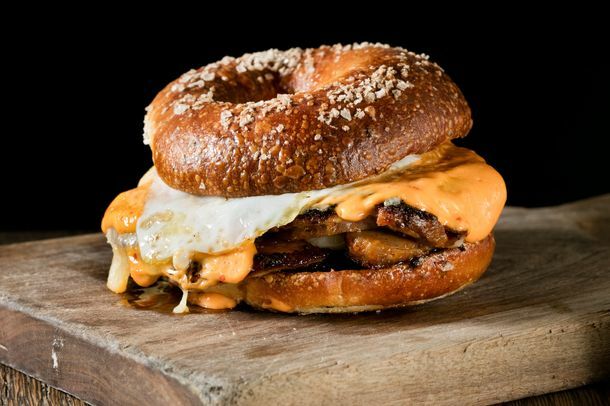 This Will Be the Year of the BagelSadelle’s, Black Seed, and others revive the dying art of Jewish appetizing. Danny Bowien Has Created a Squid-Ink Bagel for Black SeedMissy Robbins and Ivan Orkin are also a part of the new guest-chef collaboration. Black Seed Introduces Late-Night Pizza BagelsWhen pizza’s on a bagel, you can eat pizza anytime. The State of the Bagel in ChicagoThe State of our bagel is strong. Turkish Bagels Take ManhattanSimit + Smith plans to open twenty shops in two years. Are These the Twenty Most Unspoken Beliefs About the Food World?Do people really talk about this stuff? Now L’Asso EV Has Pizza BagelsThe hipster-bagel trend is more nuanced than we realized. 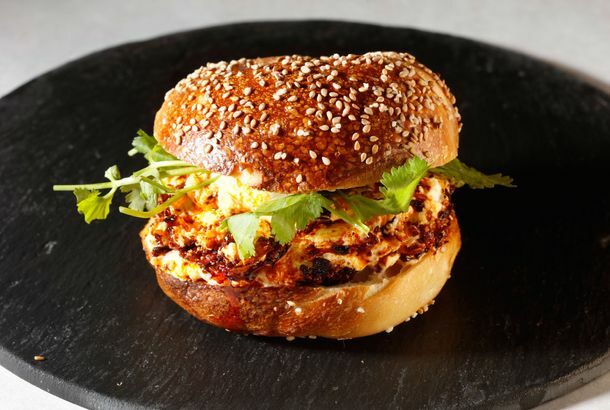 On a Roll: Roberta’s Is Now Making BagelsWe’re tempted to declare hipster bagels a trend. For Old-Fashioned-Bagel Fans, Things Are Looking UpThere’s hope yet for the cement doughnut. Now Everyone’s Fighting Over the H&H NameWe’re starting to fear the legacy of the great bagel-maker will be permanently be-schmeared. Is H&H Reopening? Everything (Bagel) Says ‘Yes’Whatever it is, it’s happening on Fulton Street. Mile End Will Start Making Its Own Montreal-Style BagelsThey did a test run over the weekend. 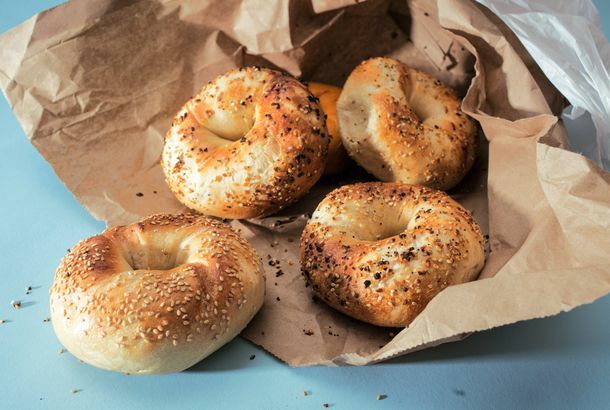 Oakland Baker Now Making the Perfect New York BagelGreat bagels are not born, but made. Also, dipped in lye and boiled first. Schmendricks Bagels Starts Small, Models Itself on a Tech StartupThey still don’t have a storefront, but they’re getting national attention. Amputee Suing Gangster Over Discriminatory BagelsIt’s ‘Goodfellas’ with cream cheese. After a Slow Death, H&H Is GoneTheir very last shop has shut down. City Council Member Claims $156 BagelAnd that’s without the schmear. Starbucks Buys Evolution Fresh; Thanksgiving Costs SkyrocketJuice is headed to your local coffee giant, while stand-alone juice stores will arrive later. Nothing Is Sacred: H&H Factory Might Eat ItWhat’s next: a flagel factory? Vic’s Bagel Bar Truck Starts Rolling FridayHow did this not happen sooner? Bagel Battle in Brooklyn HeightsMile End’s Noah Bernamoff is not impressed with B&B Empire’s “Montreal” bagels.